Whenever I start a new quilt I'm anxious to get to the part where I'm sewing the blocks together, but there's a certain amount of prep work that needs to be done first. I prewash my fabrics, so that's the first step, followed by ironing all of those freshly washed fabrics and then I can start cutting. Taking those larger pieces and cutting them into the necessary units is an fun step, too, but it's nothing compared to the magic of assembling the first block. Of course, if the quilt I'm starting is one of my own designs, then the prep work starts even sooner, when I finalize the block sizes and the finished quilt size. I also have to figure out what pieces need to be cut and make sure that I have all of the measurements right, making notes as I go. That usually means making one test block before cutting everything out for the whole quilt, just to be sure I didn't make a mistake somewhere along the line. Lots of projects involve prep work. Painting a room requires taping around the mouldings, etc. Cooking a meal involves making sure we have all the ingredients and cutting them up as needed. Sometimes we get impatient with the prep work that needs to be done before we can tackle the thing we want to be doing, but the end results are always better if we do the work that needs to be done first. Sometimes we get impatient with God, too, but you can be sure there is prep work involved in His projects on this earth. I'll never forget the time I heard Chuck Swindoll, of Insight for Living, giving a message about the birth of Jesus and he said something like, "God made it so the emperor of Rome was having financial difficulties and ordered a census so he could properly tax his people, which meant Mary and Joseph had to go to Bethlehem." I had never thought before about why Augustus needed to take the census mentioned in Luke 2, or even that God had a hand in making the census happen. God was working there, getting everything in place for Jesus to be born in the way that would fulfill all of the prophecies about Him. And look at Priscilla and Aquila, a couple of believers Paul met in Corinth, who hosted him in their home. The couple "had left Italy when Claudius Caesar deported all Jews from Rome" (Acts 18:2). Priscilla and Aquila opened their home for church meetings (1 Corinthians 16:19) and who knows how many people they taught about Jesus, all because the emperor forced them to leave their home and move elsewhere. How many others also left Rome and taught about Jesus in their new homes? How much slower would the gospel have spread around the region if those believers had all stayed in Rome rather than spreading out? It's another example of God using the emperor of Rome to make things ready for His work. Peter wrote, "I want to remind you that in the last days scoffers will come, mocking the truth and following their own desires. They will say, 'What happened to the promise that Jesus is coming again? From before the times of our ancestors, everything has remained the same since the world was first created. '"(2 Peter 3:3,4). But Peter also said, "The Lord isn’t really being slow about his promise, as some people think. No, he is being patient for your sake. He does not want anyone to be destroyed, but wants everyone to repent" (v. 9). We can't know what prep work He is doing to get ready for when Jesus will come back, but we can be sure He hasn't forgotten about His promise. We can be sure that the day will come and that when Jesus does return, everything will be exactly as it needs to be for God's plan. Are there things you're waiting on God for? Prayers you've been praying for what feels like forever and there's no answer yet? Maybe there's some prep work that needs to be done first and the answer will only come after that work is done. We may not recognize His prep work for what it is while we're waiting. It's only when we can look back that we see what God has done to make things ready, both in our situations and in us, for what He wants to do for us and through us. 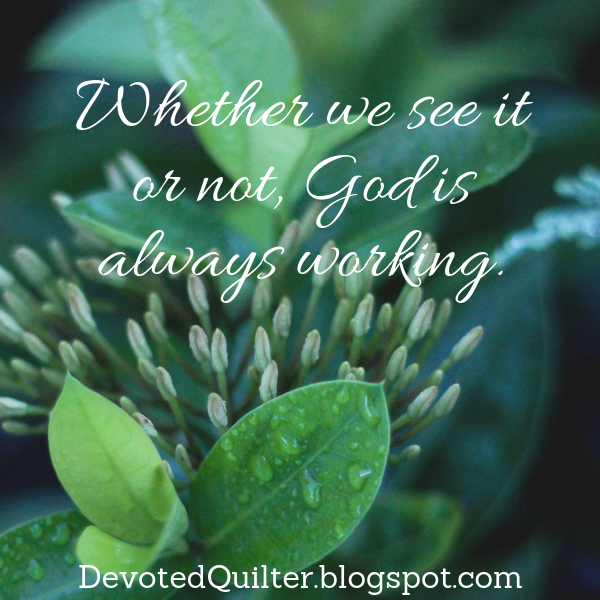 But whether we see it or not, we can rest assured that God is always working, doing everything that needs to be done to put His perfect plans into motion.